Replacing the WiFi card and the hard disk in the Wind / Advent is straight forward. After undoing all the bolts on the bottom, and easing off the bottom case, you will see the bolt that holds the WiFi card in. Undo it and the card slips out. Remove the aerial leads, and to put in a new card, do it all in reverse. 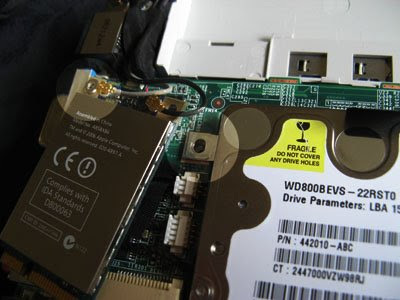 To replace the hard disk first of all remove the WiFi card. You need to do this to get access to the retaining bolt for the HD. With the WiFi card removed, you get access to the HDs bolt, undo and pull the HD out.